Former Uncle Lucius frontman Kevin Galloway created his soulful first solo effort as "a love letter, and a promise to my newly formed family" and it's as memorable as any of his previous work. Earlier this year, Uncle Lucius made their final bow. The jam band became a staple of Austin's burgeoning music scene, finding success on the road with their soulful rock stylings for 12 strong years. Capping off an extended farewell tour with a two-night stay at Gruene Hall, the band that helped define the scorching Austin Americana scene for over a decade went out with a bang instead of a whisper. They went off with fans questioning where they might go next. For such bonafide artists as Kevin Galloway, who left a life in East Texas as a banker and music minister to fully dive into Austin's trappings with Uncle Lucius, the band's end surely could not have meant his whole retirement. Galloway announced his decision to leave Uncle Lucius back in September of 2017, a good six months before the end of the band's farewell show in New Braunfels. We didn't know it then, but we do now that the next step in his musical career would be to pursue work as a solo artist. Galloway's solo career begins with the recently released The Change. Aptly titled, the album veers left from Uncle Lucius' much rowdier portrayal of Austin Americana. 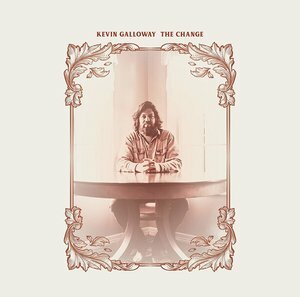 Although still firmly rooted in the Texan disposition that made his music with the band as indelible as it was, The Change presents Galloway with the unique opportunity to extend those roots past the high-paced improv of the jam band formula for something a pitched a little more softly. The music is still earthen and palpably alive but in a sense more in-tune to the folksier side of Galloway's folk-rock approach. That down-home comfort is still there, pervading each bit of The Change with an undeniable Austin flavor, but the honky-tonk Galloway is inviting us into is a little quainter. That goes hand-in-hand with life for Galloway following his departure with Uncle Lucius, with the artist previously describing it as "a love letter, and a promise to my newly formed family". With two children under three at the Galloway home, Galloway put family first by taking a step back from the breakneck tour life that Uncle Lucius provided. He did this, though, without leaving the music behind. Thematically, listeners can feel this sort-of change in Galloway from the album's opening moments. Sun shines over the furthest corners of "Don't It Feel Good to Smile", a song that conveys its tone perfectly through its title alone. The subtle sway of the album opener carries the overall story of love and keeping it in the family by painting a picture in listener's minds of an early Texas morning spent with two lovers between coffee and a cigarette. That is followed up with a blues infusion dedicated to his son, with Galloway tending to the delivery of "Face in My Mind" with careful soulfulness. That blues meets the countryside on the cool "Miles and Miles", Galloway's answer to the classic Americana road song with some windswept keys and pedal steel for good measure. The album's title track plays out like a sequence catered to depicting what Galloway himself has avoided by cooling down the tour life, detailing the story of a man who wants another try after his lover left him while he was gone "chasing his dreams". All's well that ends well for the two lovebirds, though, when he returns home for his love to hear his pleas. She notices his genuine shift in tone and gives him a chance he's needed, with an earnest conveyance of this story from Halloway keeping it from going stale from the beginning to the middle, and the end. Of course, the breezy country finesse of Halloway's accompanying band helps the affair, too, producing another captivating melody that swirls around Halloway's vocals with utmost finesse. It should be noted that The Change features two cover songs amidst a bounty of original numbers. Galloway's take on Billy Preston and Bruce Fisher's "You Are So Beautiful" is just one out there amongst the droves, but his natural, soulful inflection ferries it home with such an intrinsically emotional delivery that it most certainly stands out. As a love letter to his spouse and his family, one would imagine there would be no greater gift to press into the middle of the album to drive that theme home. His take on Hal Callery's "Hands on the Wheel" hits similar notes to the serious soul being laid out with his "You Are So Beautiful" rendition, although much subtler in delivery. In Galloway's hands, the old country tune leans further towards a gospel delivery without going over-the-top with his vocal presentation. Rather, it's the full force of the band joining Galloway that brings this cover home. Although The Change marks what it says on the tin for Halloway, he hasn't forgotten the friends he's made along the way either. Uncle Lucius co-conspirator Hal Jon Vorpahl produced the album alongside EAR Studio proprietor James Stevens. Uncle Lucius' own Jonathan Grossman hits the keys on the record, with further support from Kim Deschamps (pedal steel), Kevin Smith (bass), Doug Strahan (guitar), Benito "Ace" Acevedo (harp), and George Duron (percussion, drums). It's a whos-who of Austin favorites with a dash of Uncle Lucius charm stirred in for good measure. Even though Halloway's vision on The Change is more focused on carrying across his own story amidst his decision to leave Uncle Lucius for the sake of family, his band plays in a way that helps him tell these stories as if they were their own. This team comes together effortlessly to craft this soulful brand of Americana, and they do so in a way that makes it as memorable as previous Uncle Lucius efforts—just more under the guise of a storyteller sitting down and opening up to give us his autobiography.